Committee minutes at the Ulster Branch of the I.R.F.U. record that at a meeting of the Junior Committee at Rosemary Street, Belfast 19th November 1912 a letter was received from Larne enquiring about the possibility of entering a team for the "Provincial Towns' Challenge Cup". The secretary was instructed to send out an entry form. A report in the "Larne Times and Weekly Telegraph" on 7th December 1912 shows that no time was lost in forming a club. Records show that the draw for the 1st round of the cup was made on 7th January 1913, Lame being drawn away against Dungannon, the game to be played on 1st February. Unfortunately the match had to be postponed due to a snowstorm, much to the regret of the Larne followers as it was their opinion that "the seaside club would not be in a position to field such a strong team on a future date". The game was eventually played on 15th February and Lame won by 3 points (1 try) to nil, the score going to V. McConnell. Enthusiasm abounded and the report of the game appeared in the local paper in the form of a poem" Song of Victory - it is of interest to note that the club played in blue and white in those days. A successful run in the Towns Cup ended only at the last hurdle as Lame lost 8-3 to Carrickfergus in the final at Balmoral. On 20th May 1913, Larne's application for membership of the Branch was accepted on the proposal of N.I.F.C. seconded by Malone. Larne claim the Towns Cup beating Carrick 9-3 in the final. 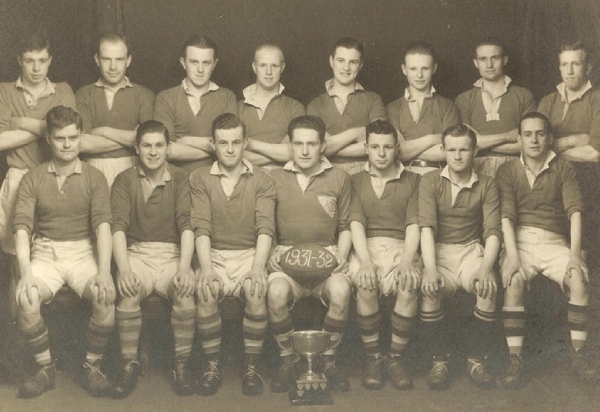 In following the season Larne played in the Junior League and the Towns' Cup and succeeded in turning the tables on Carrickfergus to win the cup in only the second year of the club's existence. In the same season the club supplied three players and three reserves for the trial match, Belfast v Provincial Towns, from which the Ulster Junior team was to be selected. W. McCluggage was selected and played for UIster Juniors against Leinster Juniors in Dublin in January, 1914. He thus became the first of a long list of players from the club to play for Ulster Juniors over the years. Larne Rugby Club were contacted by David Allan of the Royal Society of Chemistry some time ago regarding a past member who had died in the Great War. Coutesy of John McMurtry of the Front Row Union. The successful Larne Rugby side of 1913 -14 featuring Jack Griffiths (with the ball) and William McCluggage (Junior Ulster shirt). The inquiry concerned Captain John “Jack” Griffiths and research by ex Club President William Nelson uncovered the tale of this past captain of Larne Rugby Club. The research started round a picture of the 1913 -14 Towns Cup winning side in the Clubhouse which features Jack Griffiths as captain, holding the ball, to the right of his ex pupil and then team-mate William McCluggage, pictured in his Junior Ulster shirt. Captain Griffths was educated at Alun County School, Mold, and took his degree of B.Sc. at the University of North Wales (Bangor). He was appointed science master of Cleobury Mortimer College, Salop, and afterwards at Larne Grammar School, Co. Antrim, Ireland, and also the Technical Schools (Larne). Jack Griffiths taught science at Larne Grammar School in the early 1900s and was a rugby player and coach who helped the School Headmaster of the time, James McQuillan, get enough old boys together to set up the beginnings of Larne Rugby Football Club. They decided to enter the Towns Cup in 1912/13 and got to the final only to lose to near neighbours Carrick. In 1913/14 Jack Griffiths was appointed Club Captain and the team again got to the final playing Carrick but winning this time. In September 1914 the club put rugby on hold as the war broke out, and Jack Griffiths accepted a commission with the Ulster Volunteers, and was attached to the 12th Batt. of the Royal Irish Rifles, crossing to France in 1915. He was wounded in June, 1916, while leading his men in a bombing raid, for which he received congratulations. He was killed in action on July 1st whilst leading his men with great gallantry right up the enemy’s trench at Beaumont-Hamel. He was mentioned in Sir Douglas Haig’s despatch of November 13th, 1916, for distinguished service in the field. Captain Griffiths always took an active interest in sport of all kinds, and was captain of the Science Crew, U.N.C.W. Boating Club while at college. William McCluggage, of Ballyboley, was twelve years younger, and he knew Jack Griffiths well. They had been in the same classroom together, as pupil and teacher, and when McCluggage won a science scholarship to Queen’s in 1911 Griffiths had been greatly gratified. They had played rugby together, at first as learner and coach and in due course the learner became as good as his coach. 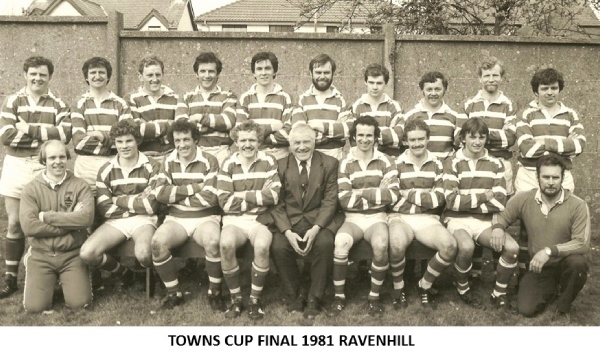 He played for Queen’s and for the successful Larne Town XV; and he became a junior inter-pro. He was an officer in the Ulster Volunteer Force, got his B.Sc. in engineering in 1914, joined the Twelfth Battalion of the Royal Irish Rifles, was commissioned, and had John Griffiths as his brother officer. On July 1st 1916 nine thousand men from the Ulster Division went into general action for the first time, at Thiepval on the Somme. Two days later fewer than two thousand five hundred answered the roll call. Among those who did not answer were Captain Griffiths (35), killed, and Lt. McCluggage (23), missing. “I am very grateful that I was contacted by David Allen of the Royal Society of Chemistry. The research pointed out the link that our club had with the First World War. We don’t have a list of club members who died during the Great War but now we know that at least two of our founding members made the ultimate sacrifice at the battle of the Somme. Even more poignant is that they were both team members in a side that was put together in 1912 – 13, the year our club began and as the picture shows they went on to win the Towns Cup the following year. There is a cup at Larne Grammar School in his memory for sports. After his death a business women in Larne donated it in his memory. Subsequent research unearthed that two current club members, Arthur James and James McCluggage are related to William McCluggage. They are pictured below with current Club President Paul Montgomery and ex President William Nelson. 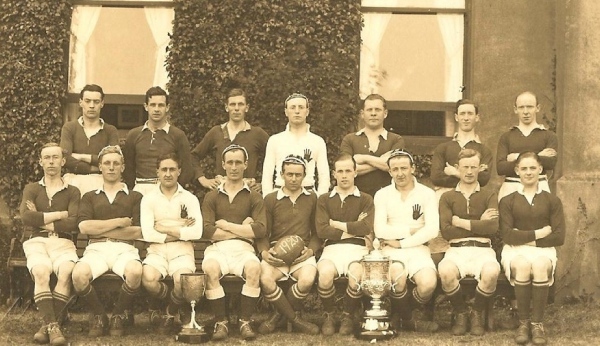 At the beginning of the 20s Larne discovered success in 3 out of 4 years in the Junior Cup. Having reached such heights the most natural step was to apply for senior status. Unfortunately the applications in May 1922 and May 1923 were unsuccessful so it was decided that the 2nd XV should play in Junior Competitions and the 3rd XV in Minor competitions leaving the 1st XV free to play Senior Friendlies. This they did with a fair degree of success in seasons 1923-24 and again in 1924-25. They also played in the Senior Cup but alas were never accepted into the Senior League. 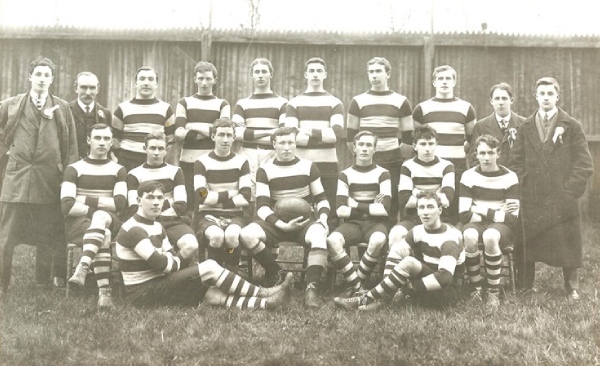 The 1st XV reverted to Junior competitions in 1925 -1926 and, as rugby expanded in the province, the club continued to flourish and play a leading part in Junior Rugby circles. Many famous names played for the club in those early years, some going on to play for the Ulster Senior XV and Ireland. Won Junior League Div. B. 2nd XV won Minor League Division A. The 3rd XV also had their days of glory, winning the Fourth Division Cup in 1929 - 1930 and again in 1933 -1934. Larne once again had a successful run to the Towns Cup Final, only to be beaten by Coleraine 14-9 in the final. In 1968 Larne Rugby Club put wheels in motion to move their HQ from Sandy Bay to Glynn. A fifteen and a half acre site was purchased in Glynn which would accomodate 3 playing pitches and a large scale pavillion. The club's initiative was welcomed by by the then mayor, Alderman Hugh Mckay, who said "The officials and members are to be congratulated on taking this step. Two years ago at the club's annual dinner I said that while the council was happy to accommodate them at Sandy Bay, Larne would not be a 'real' club until they owned their own ground." Support for the venture was expressed by the president of the Ulster branch of the IRFU, Mr. W.J. Patterson, "I am delighted to see Larne moving foward. This venture will stabilise rugby football in the town." Club president Mr. George Moore also said "Since I took over as president I have always stressed that the purchase of our own ground should be our objective. I am glad that the search is over and that we now have a firm target in view." The purchase price was £8000 of which £1500 was paid immediately with the rest being raised from members. Fund raising became a "matter of urgency" to try to reduce the effect of loan charges and a letter was sent to all members asking for donations of £100 over a 4 year period. A sale was also held in the King's Arms Hotel on 7th of December to help raise funds. The club adopted the slogan 'We sell anything', a variation of a well known businessman's slogan of 'We buy anything'. Denis Gardiner from the club played for Ulster Juniors in 1977 on Larne's ground. In 1976 work commenced on the construction of a clubhouse, supported by financial assistance from the Department of Education. The clubhouse consisted of changing rooms, showers. referee's room, a large general store and drying room on the ground floor, and a lounge bar, committee room, dining room and kitchen on the first floor. The first sod was cut by Johnny Ross, a former player, founder member and past President of the Club. The new complex was opened in April 1977 with a match between a President XV and a team chosen by Willie John McBride. A certain ex-RUC chief Constable 'Ronnie Flanagan' played at number 2 for the President's XV. With the new Clubhouse development was rapid and the number of teams increased from four teams to six teams in rapid progression. It was decided to proceed with the second phase of development and, three years later, in 1980, this was commenced. The extension, consisting of 2 squash courts with suitable changing facilities, an office, junior members room, members lounge and boiler house capable of heating the entire complex was opened in 1981 with a celebratory rugby match coupled with squash exhibition games. At this time adjacent ground became available and this was purchased to increase the area of ground owned by the Club to 22 acres. Over this period rugby at Lame flourished. 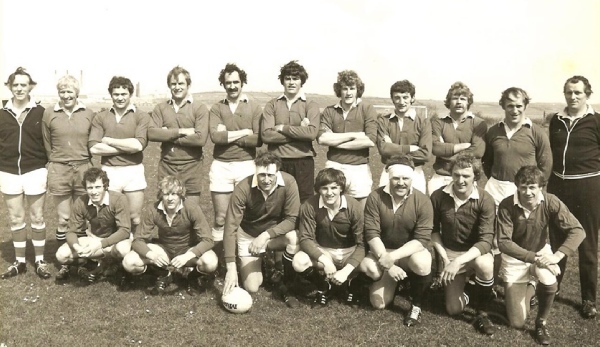 In the 1980/81 season 4 club teams were promoted with the 1st XV finishing second in their league whilst the 2nd XV were beaten by Ards RFC in the final of the Foster Cup. Just like their first Towns Cup Final nearly 70 years before, Larne faced Carrickfergus once again. It would again be a close final and provide the same victor, with Carrick claiming the win 3-0. Fortunes improved and this was a happy year around the club with the 1st XV, 2nd XV and 3rd XV winning their respected leagues. Qualifying 3, Junior 4, Intermediate 4. 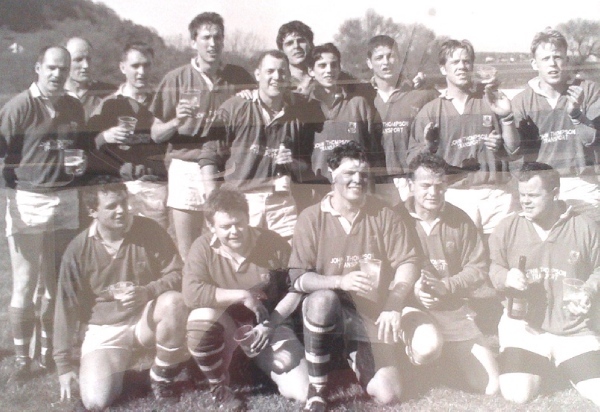 The 1st XV in 1997 got promoted into the top league by winning Qualifying 2. 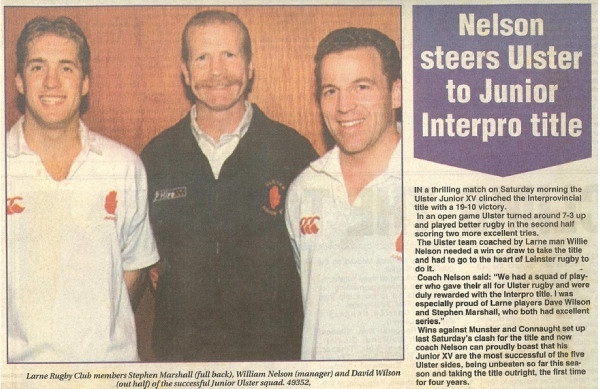 In the 1997/8season the 1st XV has held its own in the First Division of the Qualifying League whilst the 3rd XV, with a strong complement of "mature" players distinguished themselves by winning the Foster Plater. Beating Academy III XV by 10-8 in the final at Ravenhill. Apart from pieces won at Sevens Tournaments, the silver plate brought back to Larne by the victorious 3rd XV was the first silverware to adorn the Trophy Cabinet at Glynn for many a year. Club Coach William Nelson takes charge of Ulster Juniors and wins the Inter Pro Title. 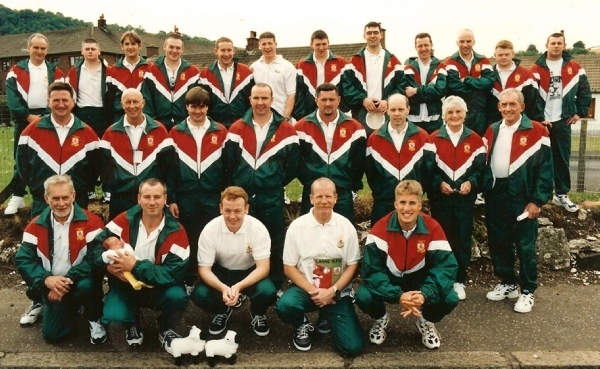 That winning squad had two Larne men, Davy Wilson and Stephen Marshall. It was also in 1998 that the club engaged in a major as guests of the Petersham club in Australia. The Pertershan club had visited Larne on a number of occasions in the past and our club was delighted to be able to visit them in their home city of Sydney. It is also noted in this year that the newly established Darts section continued to flourish.